Standards, while being definitive, do not usually serve as the best reference to the use of a programming language. Books on languages usually are able to explain usage better, but lack the definitive precision of a standard. 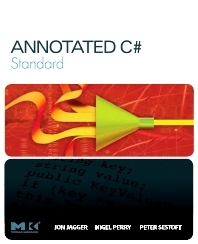 Annotated C# Standard combines the two; it is the standard with added explanatory material. Professional programmers working in the Microsoft .NET platform, from beginning to advanced, including students of programming and C# developers.